This was just started so there is nothing done really. We need members to help us start. BTW: The game will be in a GameMaker file so if you wanna code, you have to be able to code in Gamemaker. Well, basically, we need more. The roster is WIP and some of the characters will probably be dropped. Mainly characters from Akatsuki. well i could be an animator but tell me what to animate if its too much for me i may not do it ._. All of our characters are going to be 100% custom. If you would like to animate that would be great, we'll link you to the sheets once we are done with them. RomsMaster wrote: All of our characters are going to be 100% custom. 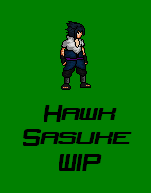 i could be a spriter lil-nek-nek u know i can sprite so i dont think i have to show my work do i???? You're hired. Feel free to sprite any character form our list. (Besides Kakashi, Sasuke, and Lee). BTW, all characters ar TS. Also feel free to join our RP world. I know he looks fat. I'll try reducing it and keeping him on a diet. both kinda but mainly the Right(our left) arm. lil_kid_neko wrote: both kinda but mainly the Right(our left) arm. K. I'll fix n' post. just post in the new topic. AND BTW JUST DON'T GIVE UP ON THE GAME ._. So wat do u think??? There are a lot of parts that do not look like they follow proportions. He seems weak xD you should give him some mustle mai boi. Oh yeah, is your Sage Naruto completed yet? If so, can I see it? I just wanna see it not for the game. Okay. I have just got done with a Kakashi but it is still a WIP, I am just getting all of my Bases done for now. Done. Hmm, now I wanna see who I wanna sprite next. we wont give up don't worry. Mai Sexii Boi is on!!! (moar spam) I can't be on for long, still have to do mah HW. damn that school ._.